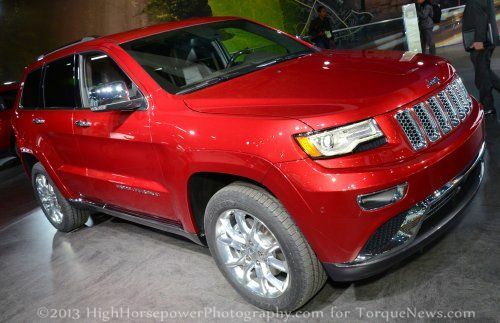 We have already talked about the Detroit debut of the 2014 Jeep Grand Cherokee SRT8 but as the 2013 NAIAS continues on, we bring you a look at the non-performance 2014 Grand Cherokee that has received a sporty facelift along with the return of the powerful and efficient diesel engine option. UPDATE: Pricing has become available on all trimlines for the 2014 Jeep Grand Cherokee including the high performance SRT model. Click here for complete pricing details! Upon first glance at the 2014 Jeep Grand Cherokee, someone might think that this is the SRT8 model due to the new styling of the front end as the lower front fascia portion of the new Grand Cherokee has a design that closely resembles both the current and previous SRT8 model. This includes diamond shaped ports on the outside of the lower fascia with a chrome strip running from side to side and top to bottom to give the Grand Cherokee a very upscale look. Along the bottom of the front fascia is an integrated chin spoiler that bolsters the sporty feel of the new Jeep while the extended fog light bezels in the middle of the bumper area closely resemble that seen on the SRT8 as well. Finally, the front end of all 2014 Grand Cherokee models including the SRT8 benefits from a new set of thin, LED trimmed headlights and a new 7 slot Jeep grille that is set in a body colored panel that provides a more fluid look than the grille design of the 2013 models. Out back, the 2014 Jeep Grand Cherokee has also be freshened up beginning with a set of thin LED tail lights that closely mimic the shape of the new headlights to add to the upscale look of the new exterior. The lower portion of the rear fascia is finished in a contrasting black with a chrome strip separating the body color and black portion of the rear fascia. Also, the contrasting lower rear valance contains a set of integrated rectangular chrome exhaust tips. The exterior changes made to the 2014 Jeep Grand Cherokee go a long way in making the range topping SUV look sportier and more luxurious but the real news with the 2014 Grand Cherokee is the return of a diesel engine option in the US market. Joining the 3.6L Pentastar V6 and the 5.7L Hemi V8 is the new 3.0L EcoDiesel V6. This powerful oil burner sends 240 horsepower and 420lb-ft of torque to the wheels via a new 8-speed automatic transmission and like the Pentastar and Hemi, the EcoDiesel is available with either rear or all wheel drive. The beauty of the new EcoDiesel Grand Cherokee is that owners will be able to enjoy the towing capacities of the Hemi with better fuel economy than the Pentastar V6. The new diesel engine option will allow the 2014 Grand Cherokee to tow up to 7,400 pounds while offering 21mpg around town and 30mpg on the highway for rear wheel drive models while the 4x4 models will offer fuel economy figures of 20 and 28. Those fuel economy figures are currently corporate estimates but we can expect them to be very close to the EPA numbers that will be announced later this year and even if the actual figures are only close to those numbers mentioned above – the EcoDiesel Grand Cherokee will easily be the most capable and most efficient SUV available in the US. Inside, the 2014 Jeep Grand Cherokee is available with all of the high tech and luxurious features that you could ask for from leather and power everything to a state of the art infotainment system controlled via a large central touch screen to the addition of the new Jeep TFT (Thin Film Transistor) gauge cluster similar to the one that debuted last year in the 2013 Dodge Dart. There is an image of the TFT gauge cluster in the gallery above on the right – click any thumbnail for a closer look. The Jeep Grand Cherokee is the most awarded sport utility vehicle ever and the changes and additions made to the new 2014 Grand Cherokee should help keep the legendary Jeep on top for years to come. The Grand Cherokee offers something for every SUV buyer – from those who want to go very fast to those who want a very luxurious experience to those who simply want a high quality, dependable SUV to get the kids safely to school on a blustery morning. Click here for a look at the high performance 2014 Jeep Grand Cherokee SRT8 and check out the gallery above on the right for a closer look at the 2014 Jeep Grand Cherokee Summit.